It’s hard for beginning guitar players. Not because it’s hard to learn guitar, but because there are so many resources and ways to learn that it can be difficult choosing where to begin. Guitar Noise has been answering your guitar questions for more than fifteen years. The answers to the most common questions are featured here. For a more complete answer check out the Best Way to Learn Guitar page and Where do I Begin? Confronted with so many choices, deciding where to begin learning the guitar can be a difficult decision. Every journey begins with a single step, and while this may seem like a carefully planned plug, you would do well to spend a few hours familiarizing yourself with Guitar Noise. First of all, what level of beginner are you? Do you even have a guitar yet? If not, you’re going to need a little support and guidance when it comes to buying your first guitar. Tuning a guitar is the single most important concept for a beginning guitarist to learn. If your guitar is not in tune, it will never sound good. Rather than having someone else tune your guitar all the time you should learn how to tune it by yourself. Once you’ve got a guitar in tune the next step is to learn some chords. Learning chords is all about figuring out where to put your fingers on the strings. If you’re planning on playing guitar for a long time and making it a big part of your life, it’s never too early to start learning how to read standard notation. At this point you’re probably ready to jump in and start learning your first song, if you haven’t done so already. Many teach yourself to play guitar books will start you off with simple strumming patterns on some rather old songs. Guitar Noise has licensed some popular rock and classic rock songs to create Easy Songs for Beginners Lessons. Each lesson takes an easy and well known song and presents it in the form of a lesson. Not only do you learn to play the song well enough to impress other people, you will also learn some useful theory and techniques that you’ll need later on. These are just some of the ways you can approach learning guitar. 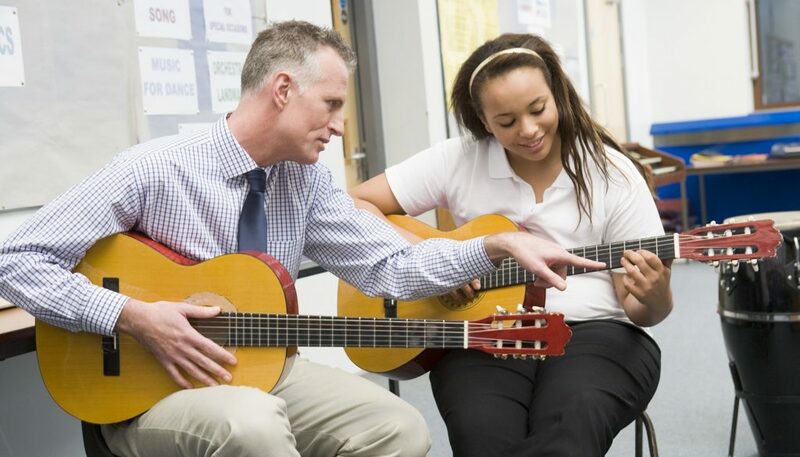 For a more complete answer check out What is the Best Way to Learn Guitar? Also worth reading is the blog post Where Do I Begin? I'm new to the guitar. Where should I start out? The greatest learning you can get is from a teacher. One on one lessons really allow you to grasp the concepts of learning at a faster rate and allow you to understand more effectively. If you are low on money and can’t afford a teacher then the internet is the next best thing. This, though, is going to mean that you will be learning ‘on your own’. Guitar Noise is the best source for free online guitar lessons. Over the past ten years we’ve published hundreds of lessons, tips and reviews for students of all levels. We feel this site has something to offer everyone – from the absolute beginner to the seasoned professional. You might be wondering what order to begin reading the lessons in. This is easily one of the most common questions we get. To give you a full answer to this question we have written a blog post entitled: Where do I Begin? We are adding and expanding our topic lessons all the time. Be sure to keep an eye on the lessons page for more. What are the first songs I should learn to play on guitar? Guitar Noise pretty much pioneered the whole “easy guitar song lesson” and we have plenty of songs to suggest! In the blog post First Songs to Learn on Guitar we list our Top Ten easy songs for guitar. Each song is relatively simple for beginners to learn, complete with chords, tabs, step-by-step instruction, and audio examples. Every lesson also explains useful things about the music, so when you learn the featured song, you’ll also pick up some tricks to use when playing other songs. What are the notes on a guitar? Learning all the notes on your guitar’s fretboard is an important early step for the beginning guitarist. Knowing where all the notes are will help you with forming chords, playing scales, as well as soloing and improvising. This chart shows all the notes on your guitar’s fretboard up to the twelfth fret. After the twelfth fret the notes repeat in the same order. For someone starting out, the inability to get a full sounding chord can lead to much frustration which, in turn, can lead to deciding that maybe the guitar is just too much trouble and not worth learning. For younger students, and also for some adults, the confidence gained by playing some single notes on various strings is all they need to make the next “step” into chord playing. I’d like to make a quick point that learning chords is not always the best way to start out, particularly for younger children. To read the full answer check out Which chords should I begin learning? Also worth a read is the article Absolute Beginners Part 1: Chords. Is there an easy way to learn barre chords? Whenever I teach barre chords to a student, I tell them before hand that they are going to be hard to learn. They are like riding a bike, though. Once you get them, you’ll never forget them. No capo in the world can do what the barre chords do for music. If you look at your index finger, it has a slight bend to it. This leaves the center of the barre hard to press down. Now rotate the finger ever so slightly backwards so the knuckle is facing toward the nut of the guitar. This flattens the finger. Sure it still has a bend to it, but it is no longer a factor because the side of the finger, which is now flattened against the fretboard, is holding down the strings. The other factor to remember is that we have been used to grabbing things with our hands and curling the fingers inward toward the palm. Now, with barre chords, we have to develop muscles we almost never use to flatten out the finger. As with all muscles, it takes time for strength and size to come about. Even though the technique may be perfect, you may have to keep at it and wait it out for these reasons. But it will come to you. The last thing I want to say about this is this, look at the barre chord. Are there other fingers doing work in the center of the fretboard? If so then you don’t have to concentrate you barring efforts behind them. Watch what you are doing and what is needed. Whether you play electric guitar or acoustic guitar, at some point you’re going to run into power chords. While the concept behind these “chords” has been around for ages, they are a staple of most guitarist’s playing, being used in music of all genres and styles. Also known as “5″ chords, as in “C5″ for example, technically, are not chords. They are simply dyads, a two-note interval composed of the root note and the fifth note of the major scale. Because there is no third, the sound of a power chord is neither major nor minor. It’s ambiguous, if you will, or simply undefined. However, when you play a power chord on an electric guitar with the distortion cranked up on the amplifier, you generate many overtones that give this neutral “5″ chord more depth and tonal color. Guitar Noise has a primer to help you understand and form any power chord you want in several different ways: Power Chords – Music 101. How do I play guitar standing up? The first thing that I would ask is where is the guitar (should I assume it’s an electric?) in relationship to your body? Most people tend to play their guitars really low because that how they see it in videos and I guess it’s really cool but it’s harder than anything to play well like that. Worse, you can develop serious wrist problems by doing that for long periods of time. If you will watch the really good guitarists (those more interested in playing well rather than showing off) you will notice that they tend to have their guitars strapped higher on their bodies. Ideally you want your hand that’s fretting the neck to be about the same height as your chest. Secondly, if you’re playing and singing at the same time, don’t be surprised if you find yourself taking a look every now and then to see where your fingers are. EVERYONE does this and if you carefully watch people playing on stage you will catch them doing it. This is especially true the higher up on the fretboard you go.I hope this helps. Whenever someone asks “how much time,” a teacher is going to respond “as much time as you can.” That’s almost a pure reaction. The reality, however, relies on two separate things: the amount of free time you truly have and the physical condition of your hands. To read the full answer check out How much time should I spend practicing? Guitar Noise also has an entire section devoted to practice tips where you’ll find all sorts of articles on this subject. A few highly recommended ones are Getting The Most Out Of Your Practice and A Question of Balance. How do I get the most out of my practice time? If you know some chords and where the notes are on the fingerboard, then you have to ask yourself, what you want to do? You already know enough to strum a lot of songs and even play song simple leads and riffs. You also know enough to start writing and playing some of your own songs. So there are a lot of choices and it’s really up to you. When my students reach a point where they have a lot of the basics down, I am often surprised by their next choices. One student of mine has recently decided that the next step is to learn how to read music so she can play classical and Spanish pieces. Another has decided to specifically target in on soloing while yet another is working on incorporating riffs into his rhythm playing. I know that this may not be the answer that you seek, but without knowing what your purpose for playing is, I truly can’t tell you what to play next. I can tell you that there are TONS of things to learn! Take some time and think about what you want to do. And then you might want to check out our articles on practice and focusing, such as Jimmy Hudson’s Getting The Most of Your Practice, my own piece, A Question of Balance on the Guitar Columns page and the new article coming out this week by Jamie Andreas, Guitar Practice Organization and Procedure. Something to keep in mind is that songs are pretty much what you’ll find yourself playing as a guitarist. When you perform in front of people, they’re not going to ask, “Would you please play the first two measures of Stairway To Heaven?” or “How about the middle part of Comfortably Numb?” They want to hear a complete song. And even if you just know the strumming part, that’s usually more than fine by them. To read the full answer check out Should I bother learning songs? Also get a head start on learning songs by reading some of our Easy Songs for Beginners and Songs for Intermediates lessons. What are some easy songs for a beginner? If you already have a grasp of guitar basics (holding your guitar, tuning it) then the next step is to start building a repertoire of songs. Unfortunately most guitar courses or teachers don’t allow you to learn the songs that made you want to play in the first place. David Hodge has written a very successful series of lessons called Easy Songs for Beginners that will get you playing in a very short amount of time. This series of lessons will teach you a bit of music theory and technique while you learn to play some pretty well known songs. For best results you really should begin with the first lesson and work your way up. After working your way through these lessons you may be ready to graduate to the next level: Songs for Intermediates. These lessons take the next logical step moving from being a strict beginner to being a well-rounded guitarist. Basically the decision whether or not to learn to read music has to be in an honest manner by the person making the choice. And the easiest way to do that is to, again honestly, list all the pros and cons about being able to read music. No lie! Get a piece of paper, draw a line down the middle and list all the good things about being able to read music in one column and all the bad things in the other. To read the full answer check out Should I learn to read music? Also get a head start on reading music by reading the part one of Standard Notation and some of the other lessons in our reading music section. Should I learn to play on acoustic or electric? We get this question a lot at Guitar Noise and I think that everyone who answers it has different opinions. There are a lot of similarities between the electric and acoustic guitar; they each have advantages and disadvantages to the beginner. It is easier to learn to finger pick on an acoustic. Barre chords and power chords are easier to learn on an electric. Because of the nature of the acoustic guitar, most people learn how to strum them but rarely take the time to explore the many styles and sounds that it is capable of. Because of the nature of the electric guitar, many beginners learn power chords and then little else. And when the acoustic player gets his first electric, he tends to play it like an acoustic. And vice versa. Which is “better?” If you say right off the bat that you want to learn electric, I would tell you that electric is better for you. Is this necessarily true? No. But since this is where your interests currently lie, it is true for you. What you learn from the guitar, or anything, is usually a combination of what you want and whether or not what you discover on the way interests you enough to take a detour. If you really want to learn a riff or a solo and you learn it, will you also take the time to figure out how you can use what you learn in another song or in a different style? Only if it interests you to do so. It used to be that people started out with acoustic guitars mostly because it was expensive to get an electric guitar (and an amplifier and everything else that you’d need). That is not the case these days. If you want to play electric and you can get yourself a good set up, then by all means do so. Because here’s the fun thing – if you choose the electric guitar now, there’s no reason why you won’t find yourself with an acoustic guitar somewhere down the road. I’d almost guarantee that this will happen. Guitar Noise has a lot of information on buying equipment. An entire section on how to buy equipment has more than a months worth of articles. You should definitely check that out first if you are not sure about what to buy. As I wrote down the usual list of items that teachers tend to discuss when asked this question, I realized that most of them, if not all, could be lumped into a single category: Impatience. Perhaps this is a bit of my trying to lump a lot of stuff into a small and neat package, but I think that it is impatience, however it might be disguised, is at the root of a lot of frustration, for guitarists and many other people as well. Will I ever succeed at guitar? Here’s my secret: I’m just a beginner myself. OK, I’ve been playing 5 years relatively steadily (as much as you can with a full time job, two kids, a husband and a cockatiel…) but I get just as frustrated in progressing. It seems like I can put hours in, and not much happens. Then sometimes I walk away for a few weeks, and pick up my guitar again, and Voila! great sounds come out! It’s part of the mystery of the instrument. I think your fingers need time to input all the learning into your creative brain, or something like that. I’m terrible about practicing scales (regular or chromatic!) and stuff like that. I know I need to spend more time with the basics. I find that learning songs that I’m passionate about is the best way for me to learn. And sometimes I work so hard on a piece, and then give up, because it sounds like dog doo. I find coming back to it later, my fingers have somehow adjusted and it flows much more easily. I too, love the sound of classical style, but I despair of ever being able to play that easily. I know if I keep working on it, it will eventually come to me. Remember that the neck is different than your acoustic, and your fingers will take a while to adjust to it. Take a look at Jamie Andreas’ stuff on Guitar Noise. She’s got some good theories for practice and I know she plays classical style. She had a nice article about feeling stuck in a certain place in developing your guitar skills, and how to get around that. It’s on Guitar Noise: Thinking: What a Concept! I find that the guitar is the master, not me! How do I find time to play guitar? Time is one of those things that we approach differently depending what we want to do with it. We find that we make time for things when we need to or want to but don’t always see where that time comes from. I started playing when I was seventeen. I was a junior in high school and basically between classes and working I didn’t get home until seven. Then homework. Then it’s time for bed already. When you’re this busy you have to make time somewhere and you also have to make the best use of your time. As a beginner, the thing I worked on most was changing chords so I could play smoothly. I did this by learning songs. So on the weekends, I would take an hour or two that I might normally not be doing much of anything (sleeping late, watching television – no computers back then or I’m sure I’d be doing that as well) and learn one or two songs. Then during the week, whenever I had a moment – perhaps before dinner or waiting for my turn at the shower (four kids in the family) or (most usually) as a reward to myself for getting through one subject’s homework – I’d play what I learned over the weekend. Sometimes only once through, but usually, when you added it up, I got to play a half hour to an hour every day. The thing is that I was always learning something. When refining a song during the week I might hit upon a technique that I’d try to remember to work into another song that I might learn the following weekend. Time adds up. Even if you manage to find fifteen or thirty minutes a day, it adds up. And if you’re honest with yourself, you’ll FIND that time and then MAKE it your guitar time. Buy a guitar stand. When I first started playing, it seemed like a lot of work to take the guitar from the case, make sure it’s tuned then make bad sounds. Then I bought a guitar stand and placed the guitar in my living room. It serves as a monument to remind me that I am not playing the guitar with the 15 minutes I’m wasting on the couch. It catches my eye when I’m surfing the channels and says “play me instead”. The instant access of the guitar allows me to get that 10 or 15 minutes in (which often turns into an hour) while I’m waiting for something else. Also, you have to practice your chords and chord changes until you master the skill. However, learn some 2 chord songs (G7 and C) or simple 3 chord songs so that you can have some feeling of accomplishment while learning. You can make “music” with these simple sings and see your progress. You might want to check out an article I wrote a while back on the subject: A Question Of Balance.